Sweet potatoes and not so sweet labels. My Labor day weekend came to an abrupt halt on Monday afternoon, when I took a trip to the grocery store on what seemed like the busiest day ever. As Patrick and I maneuvered through busy families, a sea of carts and annoyed expressions we decided to part ways to be more effective. Mind you, we were just doing my grocery shopping so bless his heart for braving the storm with me. My portion of the list included Sweet Potatoes and when I got to that section of the store I realized that things were a bit off. The section was labeled with cute wood signs and words written in chalk. The signs hung from metal bars and swung a bit every time a busy shopper hustled by. My confusion didn't come from the whimsical art but rather from the fact that they hung over the wrong vegetables. 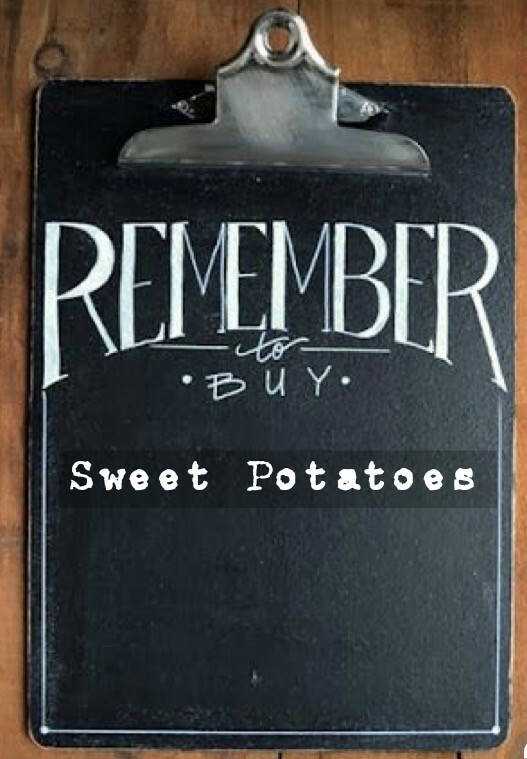 The yams were under the 'White potatoes' sign, the Sweet potatoes rested under the 'Yams' and the White potatoes under the 'Sweet potatoes' sign. I looked at the signs and then at the potatoes and then back again for probably a solid 30 seconds. Even though I knew that the Sweet potatoes were in the wrong spot, the fact that they were labeled 'Yams' made me think that I was wrong. I was just about to ask a sales clerk for clarification when I decided to trust my knowledge and just pick the darn Sweet Potato. This silly mix up in that busy grocery store got me thinking about labels. I think that the world often puts labels on us. Labels that want to tell us who we are and where we belong. Labels that distort and confuse the way that we see and understand ourselves and our worth. Labels that push against the truth of our identity and the person that God has created us to be. I remember seasons in my life where I tried so hard to be someone else. I wanted to stand out in a way that made me fit in. I wanted to be liked and to be popular and to have a boyfriend and attention and everything that I felt like everyone else had. I gladly accepted every label and identity that was pushed on me because I didn't know the power and confidence that came from having the courage to be myself. If I had more time on Monday I would have taken the time to rearrange that section of the store, just like so many years ago, when I took the time to rearrange myself. If you're feeling like you're hiding behind the not so sweet labels of this sometimes harsh world; I hope that today you take some time for yourself. Time to pull down the signs, wipe away the chalk of misrepresentation and lies and in a world trying to make you into a Yam, dare to be a Sweet Potato.